Tom Klein plays the uilleann pipes, often called the Irish pipes. 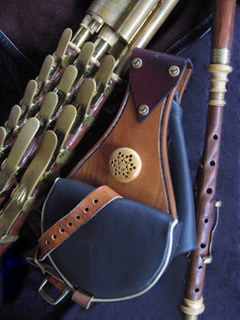 The uilleann (pronounced ill-en: Irish for “elbow”) pipes are the bagpipe of Ireland and one of the world’s most complex folk instruments. Incorporating a sweet, rich tone and built-in chordal and rhythmic accompaniment, the uilleann pipes possess a character and soul not found in any other instrument: at once beautiful, haunting…and appropriate for so many of life’s great moments and occasions. Tom lives in the richly-diverse Irish traditional music community of St. Paul, Minnesota.